An Internet troll who goes by the name "HanAssholeSolo" is having the time of his life. 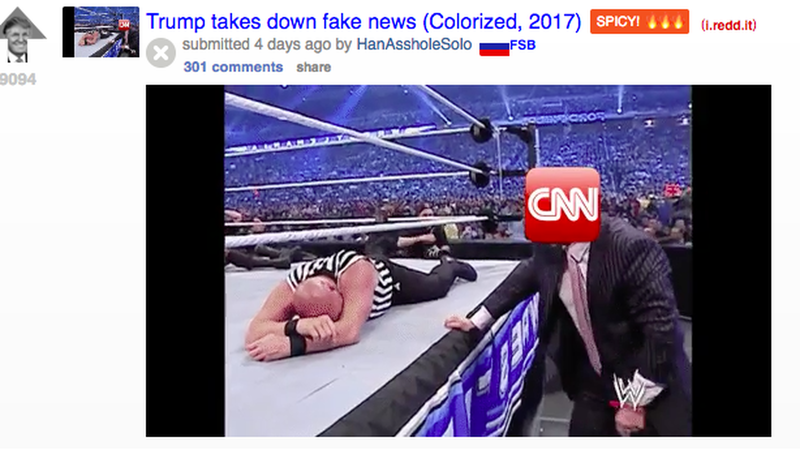 Four days ago, Han posted on Reddit a GIF of Trump body-slamming a man with a CNN logo on his head. Today, Trump tweeted Han's GIF. And forever, in this massive online underworld, Han will be a legend. For a taste of this pro-Trump online subculture, check out the subreddit named "the_donald," where alt-right fans of the President call him the "God Emperor." It's like a national holiday in there today. The top comment: "Congratulations /u/HanAssholeSolo, your dankery has been tweeted by the President of the United States."